This professionally drawn lease is specifically for a car or lorry park. It provides for practical matters relating to the parking infrastructure on the land and how the park will be operated. Features: guarantor; break provision; rent review options; options for assignment and sub-letting; draft agreement for security deposit. This car or lorry park lease is suitable for letting any land used for parking vehicles, from a temporary building site to a formally laid out, permanent park. This document should be used to let a plot of land that the tenant will use to park and store vehicles, most likely cars or lorries. The agreement allows for existing buildings or items of plant (e.g. an office or car wash) to be included within the lease. This is a professionally drawn, very comprehensive lease with massive legal protection for the landlord including a long menu of “do’s” and “don’ts”. This lease is not a compromise between the interests of the parties. It prefers the landlord’s interest. We think that is the best start point. If you wish to make concessions to your tenant, that is fine, but we want you have those choices. It includes service charge provisions to provide 100% recovery of service costs. We offer a less specific lease for land that is used for other purposes. You can find it at: Business lease: land, vacant or with plant or buildings. 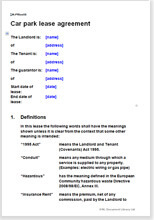 Plain English is used throughout except where it is necessary to use legal terms common in this field of law. This template is comprehensive, providing alternative choices for important decisions.